Tryggvi Hübner started out on his musical career when he was just 6 years old, studying the violin at the conservatory of Kopavogur, his home town in Iceland. When he was 12 years old he switched to guitar, studying with Eythor Thorlaksson and Gunnar H. Jonsson. From 1979 he studied music theory, history, guitar and keybords in the Reykjavik conservatory, graduating with a teachers degree in 1983. Then he went to Spain to further his classical guitar studies with Maestro José Tomas in Alicante. He has subsequently attended master classes with David Russell, Manuel Barruego and Leo Brouwer to name a few. Tryggvi is a well known session player in Iceland and has played on hundreds of albums with various styles of music, most of them as a guitarist. He has also produced albums for various artists and played keyboards and even violin on some of them. He has worked with most of the country’s famous singers, and with the Icelandic symphony orchestra. 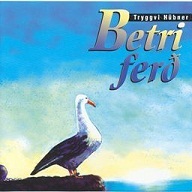 He released his first solo album ‘Betri Ferd’ – ‘A better Journey’ in 1995 and two songs from that album were published internationally by Parry/Promusic USA.